I wasn't sure whether to put this in General or Off Grid, so I split the difference and here we are. I'd like to discuss the advantage of evil. By this I mean the advantage an individual receives towards the realization of their goals by being willing and able to act unethically and immorally. Some examples: A businessman who grows wealthy by engaging in inside trading; A politician who gains office by lying about his opponent; An athlete who wins a competition by cheating; A cultist who gains a loyal following by preying upon the weakness and fears of believers. It's commonly understood that evil will eventually lose. We see this trope appear again and again in good storytelling and it does appear to hold some truth in real life. Most people prefer to live in a good society and most criminals are eventually caught (for something, at least). But some evil people do flourish. So I leave the topic at that. What is the advantage of evil? I could have told you where to stick the thread. But it is a fair question for discussion. I do not deal with evil. On occasion I used to get over-whelmed with negativism and I did things that others may have considered evil. But I never had inner peace when I did something evil. I guess that would be the bottom line for me. You raise a good point that I should have mentioned before. When a normal person engages in evil behavior they often feel remorse. When an evil person engages in evil behavior they feel no remorse. They may even feel pleasure. We're getting into real evil here, wicked stuff. So for the point of this conversation we can discuss both topics - evil done with and without remorse. Evil is an Energy-Veil which means the truth was misqualified. Everything is Good and perfect until somebody messes it up only to return to being good again. Evil and Good are subjective valuations by man. From the perspective of Dao, is there any difference? The advantage of evil? It sells. I am not so debased that I am not appalled that money tends to follow "evil." What can be done about it? For all the good that money could do in this world, it tends not to. Am I wrong? I remain happy (relatively) without money. On a personal level, I want for nothing. As an artist, I do not seek recognition or money. It's just for the art's sake and not even that really, it is about my experience with it. I look at evil through the lens of an artist. Evil spelled backward is live. What was it that President Dubya said that time? Peace is fine and all but there ain't no money in it. "Money trumps peace." One can look straight through the deceivers and see them for what they are. Yet, if one deceives themselves, all is lost. A current example is some folks calling Trump a con man and thinking Obama is something different. It's rather amazing to watch. So, perhaps, I deceive myself and tell myself, I am not a lowlife debased type of character. My evils are artistic, subtle, less harmful, on a higher plane. Yes! That's it, the higher plane of evil. And with that, all the truth in the world becomes one big lie. Notice how close the word lie is to evil? Just missing a v, for virtue perhaps? It's the nature of language. Does anyone know Oscar Wilde's theory, why John's head got served up on a plate? The sun shares its light with all. Brave Helios! Unless you are under a rain cloud then it rains on everyone equally. Perhaps it is that evil is effective, at least for the moment? Valid thought although I will not argue in favor of it. It all depends on what you want from life. Evil as commonly understood would probably be a bad thing to do when you want a "spiritual life". But what if you don't care about spirituality? What if you want to play all or nothing? What if you crave for spectacular events? Or if you want to become rich and famous? Or respected and feared? Further I don't believe we live in a just world. Often the "bad guys" win. We had a nice discussion of Robber Chih a while back. 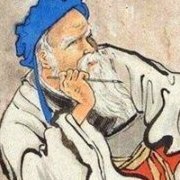 And it is true, if it is possible then it is within the realm of Dao. And true there are those who don't care what others think about them as long as they get what they want. And I agree, oftentimes the bad guy wins and never gets caught. I guess that is within the realm of Dao as well. If we personally have a sense of justice, then it's up to us to establish that justice as best we can. It definitely seems that way. But evil not only harms us and others in the short term (sometimes in ways that aren't so apparent), it also does so in the long term (which is usually much more apparent). Those who live well do so because they've followed the good path. Is it that evil is predatory? A lion kills a lamb and we call it natural. It's hard to define evil in any objective manner. Perhaps willfully ignoring the golden rule (do not do to others what you don't want to be done to yourself) comes close. What's spiritual about following the golden rule is the recognition that within the grand scheme of things each individual is no more valuable than another. Of course one could also see the world as one big battle field, and from that perspective ones importance depends on ones success in defeating others. Somebody who is successful along that road will consider his success as proof of the correctness of his evil approach, and he will look down upon those others who were apparently not ruthless enough to get to the top. But not all evil people make it, and many will end up worse. But that's all in the game. When someone chooses an evil way of life knowing full well that there is a big chance that he will fail, than there is no way to convince that person that he should live his life differently. ... probably ego based more than natural? A man can kill 20 lions just to feed is ego. It's hard to define evil in any objective manner. I hoped that someone would mention this. Would like to know that. Good point. Killing out of necessity (e.g. to eat) is not evil. Killing unnecessarily (e.g. for sport) is evil... but is it possible there is a different necessity at play? If a dictator kills unnecessarily it spreads fear. This fear may actually be necessary to maintain control, so from that point of view "unnecessary" killing is absolutely necessary. Sure, the Tao knows better than we do. However, what should be our role as so-called human beings in that play? This for me is the real question. Existence is not quite as stupid as you imagine. It is with you every moment of your life and watches the choices of your heart. Even ... as you act like there is a private space that you can corrupt with nobody knowing. The road opens in front of you, how will you meet it ? In daily life, be competent. the advantage an individual receives towards the realization of their goals by being willing and able to act unethically and immorally. Does this mean that there is no evil or that there is no advantage to evil? Perhaps. I don't disagree with you, but I feel there may be more to it than that. How does this explain evil spirits, gods and demons? Do such things not exist? Are at least some of them not evil?